Computer scientists at the University of Alberta have solved checkers, the popular board game with a history dating back to 3,000 BC. 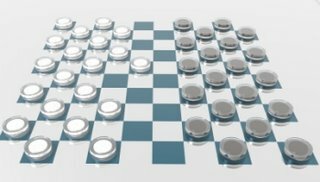 After 18-and-a-half years and sifting through 500 billion billion (a five followed by 20 zeroes) checkers positions, Dr. Jonathan Schaeffer and colleagues have built a checkers-playing computer program that cannot be beaten. Completed in late April this year, the program, Chinook, may be played to a draw but will never be defeated. The results of this research were published recently in the journal Science. "This is a tremendous achievement — a truly significant advance in artificial intelligence," said Dr. Jaap van den Herik, editor of the International Computer Games Journal. "I think we've raised the bar — and raised it quite a bit — in terms of what can be achieved in computer technology and artificial intelligence," said Schaeffer, chair of the University of Alberta Department of Computing Science. "With Chinook, we've pushed the envelope about one million times more than anything that's been done before." A self-described "awful" checkers player, Schaeffer created Chinook to exploit the superior processing and memory capabilities of computers and determine the best way to incorporate artificial intelligence principals in order to play checkers. With the help of some top-level checkers players, Schaeffer programmed heuristics — rules of thumb — into a computer software program that captured knowledge of successful and unsuccessful checkers moves. Then he and his team let the program run, while they painstakingly monitored, fixed, tweaked, and updated it as it went. An average of 50 computers, with more than 200 running at peak times, were used everyday to compute the knowledge necessary to complete Chinook. Now that it is complete, the program no longer needs heuristics — it has become a database of information that knows the best move to play in every situation of a game. If Chinook's opponent also plays perfectly the game would end in a draw. "We've taken the knowledge used in artificial intelligence applications to the extreme by replacing human-understandable heuristics with perfect knowledge," Schaffer said. "It's an exciting demonstration of the possibilities that software and hardware are now capable of achieving." Schaeffer started the Chinook project in 1989, with the initial goal of winning the human world checkers championship. In 1990 it earned the right to play for the championship. The program went on to lose in the championship match in 1992, but won it in 1994, becoming the first computer program to win a human world championship in any game — a feat recognized by the Guinness Book of World Records. Chinook remained undefeated until the program was retired in 1997. With his sights set on developing Chinook into the perfect checkers program, Schaeffer restarted the project in 2001. "I'm thrilled with this achievement," he said. "Solving checkers has been something of an obsession of mine for nearly two decades, and it's really satisfying to see it through to its conclusion." "I'm also really proud of the artificial intelligence program that we've built at the University of Alberta," he added. "We've built up the premier games group in the world, definitely second-to-none. And we've built up a strong, international, truly world-class reputation, and I'm very proud of that." Research aimed at understanding the mechanisms underlying embryo development has taken a step forward thanks to collaborative work between biology and mathematics. 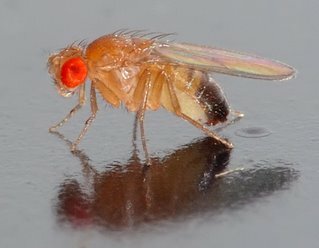 A study of wing formation in the fruit fly (Drosophila melanogaster), led by the researchers Marco Milán and Javier Buceta, both in Barcelona, has led to the discovery of a new genetic function involved in this process, and furthers our understanding of the internal laws which regulate it. The development of a living being is based on general laws written into the genetic code of each cell and which enable the cell to develop a specialist function, modifying the way they divide, their form and their behaviour. These changes are coordinated through a series of instructions that must be correctly interpreted within the cell, and this means that the information must pass along a pathway of signalling molecules. These pathways have been conserved across evolution, and therefore studies using models such as the fruit fly provide information about these same processes in humans and other animals. The Developmental Biology of Drosophila Group from the IRB Barcelona, led by Marco Milán, studies the signals that guide wing development in Drosophila. The wings are generated from a set of cells grouped into different segments or compartments that never mix with one another, and which enable the symmetrical construction of the dorsal and ventral parts starting from a given limit or border. This process of subdivision into compartments also takes place during the formation of the vertebrate central nervous system, and the genes and signalling pathways involved are conserved in both Drosophila and vertebrate species. Although biologists already had an intuitive idea of how the limit or border between these compartments was generated, there had been no systematic study taking into account all the relevant elements. Therefore, and with the backing of a group led by Javier Buceta, they decided to use mathematical modelling to better understand the internal mechanisms which regulated this process. In this way they identified certain interactions in the signalling pathways that brought to light a number of contradictions and showed that a key step was missing in their model. As Milán explains: “Thanks to this computer simulation we have found a new genetic function that ensures the stability of the system and has enabled us to test its robustness. This study shows that modelling is a highly useful tool for describing in silico new properties of a biological system and being able to corroborate them subsequently in vivo”. In this regard, Buceta, who leads the SiMBioSys group, dedicated to modelling biological processes, explains that “the advantage of these modelling techniques is that they can simulate genetic and cell interactions as a set of mathematical equations and, therefore, to determine the feasibility of a biological mechanism”. In order to study the stability of the system they conducted around 45,000 different in silico experiments, introducing variations in twenty parameters. The results have enabled them to identify the most important system parameters and showed that the biological mechanism maintained its functionality in 91% of the cases analyzed. According to Milán and Buceta “this study confirms the hypothesis that if this gene network has been maintained across evolution in both vertebrates and insects, it is precisely because it is highly stable and robust”. You can read the full article in the journal PLoS One. You can read more about the mathematics of embryo development in the Career interview with a biomechanical engineer on Plus. This week, researchers from the University of Cambridge will be arriving at the Summer Science Exhibition of the Royal Society armed not with the latest in cutting-edge lab technology, but an assortment of simple toys. But while many of these playthings may look like Christmas stocking-fillers purchased from the gift shop at a museum, their behaviour is helping scholars to understand the evolution of weather patterns and the magnetohydrodynamics of spinning stars and planets. They include spinning eggs that rise against gravity, objects that spontaneously reverse their sense of spin and discs that roll at an accelerating rate before coming to a standstill. In each case, their behaviour has been baffling some of the sharpest scientific minds for years. "Understanding the behaviour of spinning toys can teach us a lot about some of the fundamental principles of dynamics," Dr Tadashi Tokieda, College lecturer at Trinity Hall, Cambridge, explained. "The toys themselves are very simple, but the way in which they behave is so strange that they have intrigued anyone who has studied mechanics at graduate level. One of the things we hope to point out is that some of the most important experiments can take place not in the lab, but in daily life. Good scientists take toys seriously." One example of a toy that seems to defy the laws of physics is the "rattleback" - a small, symmetrical canoe-shaped object that spins smoothly in one direction, but when spun the other way rattles and reverses its motion. Its mysterious behaviour was this year explained in a paper by Professor Keith Moffatt FRS, also at Cambridge University, and Dr Tokieda, as being a subtle effect of what is known as chirality – the result of the object's skewed mass distribution. The behaviour of this toy could offer insight into a bigger problem. Every million years or so, the Earth's magnetic field reverses, causing the planet's magnetic north and magnetic south to interchange. Scientists are still at a loss as to what causes this, but the rattleback toy mimics certain fluid dynamical processes in the Earth's liquid core that are responsible for the excitation of its magnetic field. "In the case of each toy that will be on display, mathematics, coupled with computation and high-speed photography, and above all simple, imaginative experiments that everyone can do, is helping us to explain their surprising and behaviour," Dr Tokieda added. The Royal Society's Summer Science Exhibition is held annually at the Royal Society, the UK's national academy of science. The event is free and open to the public. This year, 23 interactive exhibits will be on show presenting the best in UK science, engineering and technology. During the four days, more than 4,000 people are expected to explore the exhibition. The event will run from Monday 2 to Thursday 5 July. Other maths on display at the exhibition include sound waves, extreme pressure and optical illusions. More on maths at the Summer Science Exhibition. More on strange spin, chirality and the Earth's magnetic field on Plus. Plasma astrophysicists at the University of Warwick have found that key information about the Sun's "storm season" is being broadcast across the solar system in a fractal snapshot imprinted in the solar wind. This research opens up new ways of looking at both space weather and the unstable behaviour that affects the operation of fusion powered power plants. Solar wind consists of a stream of plasma, mainly protons and electrons, that are ejected by the Sun's corona. On its way out the wind interacts with the Sun's magnetic field, broadcasting it across the universe. The researchers, led by Sandra Chapman, measured the strength of the magnetic field in the solar wind. They found that when the Sun is at the peak of its 11-year cycle, the graph they were plotting turned into a fractal. At this point the solar corona was at its most active, stormy and complex, due to sunspot activity, solar flares, etc. When the corona was quieter no fractal patterns were found in the solar wind. This new information will help astrophysicists understand how the solar corona heats the solar wind and the nature of the turbulence of the solar wind with its implications for cosmic ray flux and space weather. The techniques used to find and understand the fractal patterns in the solar wind are also being used to assist the quest for fusion power. Researchers in the University of Warwick's Centre for Fusion, Space and Astrophysics (CFSA) are collaborating with scientists from the EURATOM/UKAEA fusion research programme to measure and understand fluctuations in the world leading fusion experiment MAST (the Mega Amp Spherical Tokamak) at Culham. Controlling plasma fluctuations in tokamaks is important for getting the best performance out of future fusion power plants. Find out more about fractals in Plus, and read more about fractal solar winds in New Scientist. The geometry that gives rise to rainbows may help scientists to find out whether other planets contain water, which is necessary to sustain life. Rainbows are formed because light rays are bent, or refracted, and scattered as they enter droplets of liquid that hang in the atmosphere. The refraction occurs because light waves are slowed as they enter the droplet — think of a shopping trolley slowing down as you push it onto a lawn at an angle, and changing its direction as a result. The amount by which the light rays are slowed, and hence bent, depends on the liquid's consistency and is measured by its refractive index. Thus, different liquids give rise to rainbows at different angles, a fact that enabled researchers to determine that the clouds of Venus are droplets of concentrated sulfuric acid. Researchers now suggest that the same approach could be used to detect clouds made of liquid water in a planet's atmosphere. 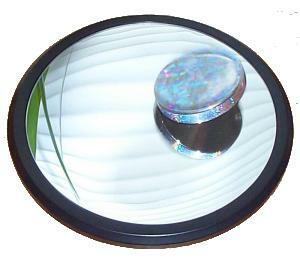 Read more on the ABC News in science website, and find out more about refraction on Plus. The proportions of a DNA molecule in a human cell are equivalent to a 2000-mile-long rope packed inside the Millennium Dome. When DNA replicates, it spins at an astonishing 10 turns per second. Therefore, it is hardly surprising that DNA can become highly twisted, super-coiled and even knotted! To understand this phenomenon, the molecular biologist must grapple with the mathematical concepts of twisting, writhing and knotting. In this highly-illustrated talk Professor Michael Thompson FRS will experiment with strings and rubber bands (bring your own!) to explore the geometrical rules which underlie the transmission our genetic code. In honour of the Large Hadron Collider, the Dana Centre is holding an evening dinner and discussion attended by the expert James Gillies from CERN. There'll be slide shows and photographs and a two-course meal inspired by particle physics. Tickets: £15 per person, including a two-course meal and a drink. Tickets have to be booked by calling 0207942 4040 or e-mailing tickets@danacentre.org.uk. Age range: this event is open only to those over 18 years of age. More information: Visit the Dana Centre site. Also the Science Museum in London has put on an exhibition in honour of the Large Hadron Collider. The exhibition is free and will run until the 7th of October 2007. You probably knew that Einstein was a great scientist, but did you also know that he played the violin? In this unique double act a virtuoso violinist and the head of the department of particle physics at Oxford University combine the electricity of a live musical performance with an insight into the deepest corners of the Universe. The lecture explores Einstein's life, both in science and in music, from his theories that shaped space and time, to modern ideas in particle physics. Tickets: £6.50, £4.50 concession, available from The Oxford Playhouse on 01865 305305.